Life is pretty tough for rabbits. It seems like everything wants to eat them. Bobcats, coyotes, raptors and even snakes. The Eastern Cottontail, which is the most common in our area, is lucky if it lives two years in the wild. Thank goodness they are prolific reproducers. 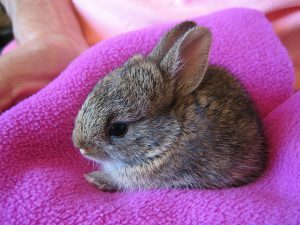 Cottontails begin breeding as early as two months old and can have up to seven litters in one year, although they usually have three or four. There are three native wild rabbits in Texas and one hare: the eastern cottontail, swamp rabbit, desert cottontail and the black-tailed jackrabbit. The jackrabbit is actually a hare. However, they all belong to the Lagomorpha order of mammals. Hares are larger animals and have longer ears. A hare’s pregnancy lasts 42 days. Newborn hares are called leverets and are fully developed at birth, born with fur and eyes open. Mom doesn’t build a nest but can deliver her young in something as simple as a depression in the ground. Babies are able to hop around shortly after birth. Female rabbits give birth after about 30 days. They build a nest three to four inches deep and about eight inches across. They line the nest and cover it with soft dead grass and some of her own fur. Newborn rabbits are called kits or kittens and are born with eyes closed and no fur. Compassionate people with good intentions will sometimes “kidnap” baby rabbits thinking they have been abandoned or that something has happened to mama rabbit. Mom only feeds her young at dusk and dawn so chances are, you probably won’t see her. If the babies are warm and appear to be well fed, she’s taking care of them. Just to be sure, here are a few things you can try. Place string or yarn in the shape of an “X” on top of the nest in the late afternoon. You can also encircle the nest with flour. In the morning, check the nest. If the string or flour has been disturbed, Mom has been there taking care of her kits. With spring comes lawn-mowing. A WORD OF CAUTION: if you see small “dead” sections of grass in your lawn, check it out before mowing. It may be a nest of baby rabbits. If it is a nest, you can simply lift the top layer of dead grass to reveal sleeping babies. Please leave them alone! They will be gone in a couple of weeks. Please be sure to protect nests from your dogs, too. If your dog discovers a nest, you can cover it with a wheelbarrow or fencing making sure there is an entrance point just large enough for Mom to go in and out and strong enough so the dog can’t tear it down. There are other options, too. Just do a little research on the internet. TWRC Wildlife Center is here to help. If you have questions about wildlife or find an injured or orphaned animal, please call us: 713-468-TWRC. You’ll also find cute photos and good information on our Facebook page. Please “Like” us!